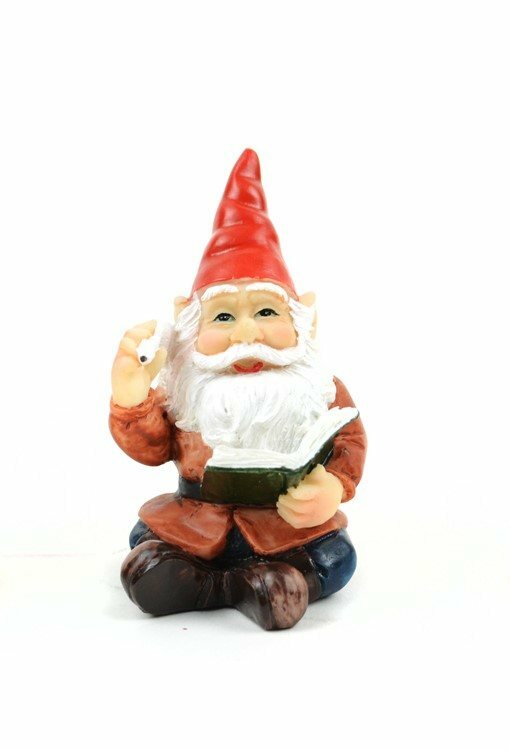 Friendly gnome sitting writing in a book with his quill pen. - Coat with polyurethane varnish to protect colour from weathering, however can be repainted if fading occurs. - Handle with care, may break if dropped on a hard surface. Click here for more detailed product care and general miniature gardening information. 1. Fairy garden miniatures come in many different sizes and do not have a specific scale. Please consider the size when selecting items from different ranges to ensure they will complement each other and your miniature display. Having said that, we have seen first hand that children are not at all concerned with scale and will create magical scenes with items of all sizes. Older enthusiasts however may like to be more mindful of this. 2. Fairy ornaments and miniature accessories are not toys. It is the responsibility of parents/guardians/carers to consider the age and stage of development of the child and gauge the suitability of our items, as some are hazardous to young children due to the pointed ends, sharp edges or very small size (choking hazard). If not handled with care or dropped on a hard surface, they could break. We recommend that you keep any items of concern out of reach of young children and supervise play.